Today is the 2nd group ride of the year. We were supposed to start riding at 6:30am but I'm the one who set the time 6:30am, I woke up late instead - 6:34am. Luckily all my things are already prepared last night - the bike, the clothes, the drinks, the sandwich -----. Brushed my teeth, change clothes and off I go to my mother's house. Nasib baik rumah hampir (less than 2 mins). We started around 6:47am. After breakfast, all of us lepak at our mother's house and diteruskan dengan aktiviti mencuci basikal since most of our house tidak ada air (rumah bukit) and my mother's house ada air eventhough the water pressure is low. So masa lepak lepak, we have come up with a few ideas how to improve our team clothing jerseys and long distance ride activities. Bicycle competition in Malaysia & Singapore 2009/2010. 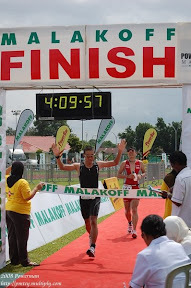 We are targeting the Singapore 100KM MTB 2010. Some of the projects will be carried out as soon as possible since the Triathlon is coming soon - Polo shirt for our support crews during the competition.